As a private company, Bloomberg LP provides little data on its performance. Nonetheless, the firm highlighted that it employed 19,000 staff in 2017, meaning that its operational and managerial capabilities were highly developed (Bloomberg, 2018a). The firm’s revenue for 2014 was reportedly equal to $9 billion, which further demonstrated that Bloomberg possessed significant revenue-earning capacities (LaRoche, 2014). Another major point was that the sustainability and philanthropy programmes launched by Bloomberg LP were highly effective. For example, Miller et al. (2018) estimated that the Bloomberg road safety programme saved at least 19,000 lives. On the other hand, Chauhan and Kumar (2018) noted that the insights offered by Bloomberg LP frequently determined the behaviours of investors in a wide variety of settings. The key implication of this finding was that Bloomberg LP needed to provide a consistently high level of service quality and had significant responsibilities over the major global financial processes (Chauhan and Kumar, 2018). Bloomberg LP could benefit from strategic analysis and the resulting practical recommendations outlined in this document. The PESTLE framework is widely accepted among researchers as a vital tool of macro-environmental analysis (Zalengera et al., 2014). The report applies this framework to the US, which serves as the domestic market for Bloomberg. The Trump administration has introduced significant volatility into the stock markets of North America (Pereira et al., 2018). This has raised the demand for the services of Bloomberg LP, but also increased financial risks for the company. The GDP of the USA was equal to $22 billion in 2017 (TradingEconomics, 2018). The figure raised the potential for business growth, benefitting Bloomberg LP. However, the tax cuts reduced the economic well-being of smaller firms and non-profit organisations (Wagner et al., 2018). The philanthropy programmes of Bloomberg LP faced increased economic pressure. The US is an example of a socially aware environment in which the citizens are interested in the key political and economic trends (Lergetporer et al., 2018). This constitutes a notable public relations risk for Bloomberg LP if the company is deemed responsible for negative economic outcomes. Nonetheless, this also arguably raises brand awareness (Lergetporer et al., 2018). The popularity of open application programming interfaces (APIs) is a major trend both globally and in the US (Durante and Elsaid, 2018). Bloomberg LP could develop new products (such as open software for financial analysts) as a promotional effort (Durante and Elsaid, 2018). That said, the costs of such marketing initiatives are difficult to estimate. The labour legal system in the US is highly individualistic which promotes entrepreneurship (Ang and Fredriksson, 2018). Bloomberg LP could increase its market share by attracting the founders of new businesses. Nonetheless, the legal framework of the US is complicated by the differences in state laws (Ang and Fredriksson, 2018). The company might need to increase spending on its legal internal audits. Both the general public and the formal institutions in the US are highly concerned with the environmental impacts of individual businesses (Jacobs et al., 2017). Bloomberg LP could leverage this as a business opportunity by offering sustainability advice, but also faces similar pressures from its stakeholders (Jacobs et al., 2017). The overall attractiveness of the US as an environment for Bloomberg LP is graphically represented in the following table. A scale of 1 to 10 is used to conduct this analysis. To summarise, the US represents a highly attractive market for Bloomberg LP because of its high level of development reflected in the reviewed political, economic and technological factors. At the same time, the company faces issues in stakeholder relations arising from the current sustainability and social trends. Another major critical point is that the US may be over-saturated with systems focused on economic development (Bloomberg, 2018a). A geographical expansion could benefit the long-term profitability of Bloomberg LP. Building on the above findings, the study conducts an examination of the micro-environment of Bloomberg LP. The SWOT framework is applied because of its popularity in the context of business research (Phademrod et al., 2018). The key strength of Bloomberg LP was the quality of the company’s value offering. The firm possessed the necessary capabilities for providing personalised services based on reliable and valid data, which was also supported by its high innovation capacities (Bloomberg, 2018a; Durante and Elsaid, 2018). Nonetheless, this also meant that the firm’s performance faced pressure from its customers to be consistently high which was a major source of risk for the company (Johnson et al., 2017). The lack of tangibility applicable to service firms was also relevant in the case of Bloomberg LP (Johnson et al., 2017). Financial crises could also significantly decrease the performance of Bloomberg by negatively affecting the number of its clients as well as the firm’s own financial reserves (LaRoche, 2014). To account for these issues, geographical expansion and product standardisation were considered as the most suitable strategies. Nonetheless, their feasibility remains questionable which is evaluated further in the final section of the report. 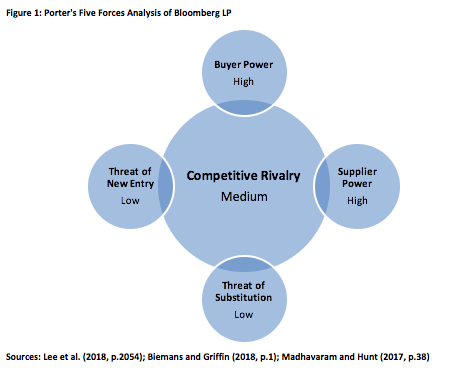 The Five Forces framework of Porter (1985) is invaluable for estimating the degree of competitive rivalry faced by a firm. The following figure applies this model to the case of Bloomberg LP. Bloomberg LP provides highly customisable services for large corporations, meaning that the customer switching costs are high (Madhavaram and Hunt, 2017). Despite this, the majority of Bloomberg’s clients are arguably not price sensitive because of their own cash reserves and the importance of financial advice for long-term profitability (Lee et al., 2018). 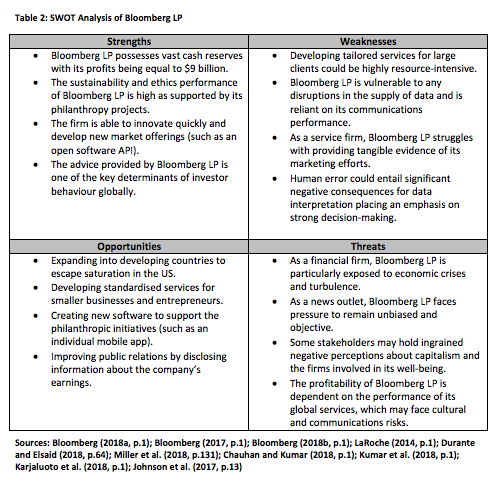 To consistently satisfy the needs of its client base, Bloomberg LP is dependent on its suppliers of data and the talented personnel responsible for its interpretation and decision-making (Biemans and Griffin, 2018). The above means that both buyer and supplier power are high representing the key areas of concern for Bloomberg LP. At the same time, the company is protected by the inimitable nature of its value offerings and the established data networks unavailable to new entrants (Madhavaram and Hunt, 2017). Coupled with these findings, the degree of service differentiation offered by the organisation lowers the intensity of competitive rivalry to medium. Nonetheless, the company needs to protect itself against the power-driven demands of its partners and clients by launching standardised services and considering new foreign markets. 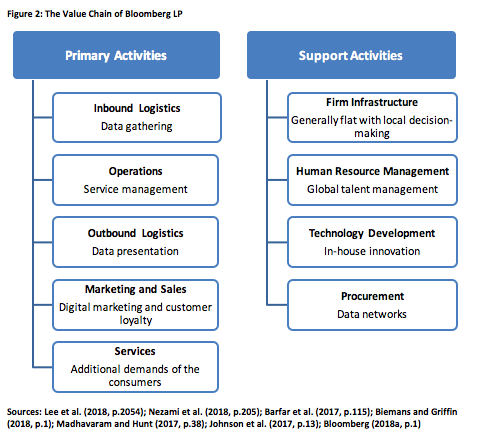 The Value Chain framework of Porter (1985) is applied to Bloomberg LP to establish any further needs for strategic changes arising from the structure of its operations. The next figure summarises the results of this evaluation. The report acknowledges that there existed little secondary data on the structures, operations and logistics of Bloomberg LP. Based on the firm’s core value proposition, its inbound and outbound logistics are focused on data gathering and data presentation respectively (Bloomberg, 2018a). The data networks (procurement) serve as one of the major strengths of the organisation (Nezami et al., 2018). These activities are supported by Bloomberg’s ability to support a relatively flat global infrastructure exemplified by opening the firm’s new headquarters in Europe (Bloomberg, 2018a). On the other hand, the company’s operations, services and marketing are dependent on its ability to account for the highly personalised needs of its B2B clients, which puts an emphasis on customer loyalty (Barfar et al., 2017). Losing a single client is a significant risk for Bloomberg LP. While these processes are supported by global talent management (e.g. employee exchange programmes) and in-house technological developments, Bloomberg LP is in need of new risk management strategies (Bloomberg, 2017; Durante and Elsaid, 2018). One major recommendation made throughout the report was that geographical expansion was needed for Bloomberg LP. Malaysia is considered an example of a suitable country. Since its economics are currently developing, the majority of Malaysian firms experience turbulence and issues in financial decision-making (Alifiah, 2014). This means that the services of Bloomberg LP would be in high demand. Nonetheless, the company may want to reduce its risks when entering the Malaysian market. It would be suitable to only partner with 3-4 large Malaysian organisations to form close B2B customer relations while still raising brand awareness in the market (Johnson et al., 2017). Service standardisation was another key implication of the results of the above analyses. The report proposes Bloomberg LP to create a subscription-based mobile app for regular customers. The software would allow these clients to track their expenses, review the most prominent trends in their habits and access a small database of financial advice provided by the Bloomberg LP professionals. This would reduce the pressures identified during the Porter’s Five Forces analysis such as high buyer power (Madhavaram and Hunt, 2017). At the same time, the app would need to handle sensitive data raising the importance of cyber-protection methods provided by Bloomberg LP (Chong et al., 2018). It is challenging to estimate the costs for its development because of the lack of evidence provided by the company. To summarise, global service firms could face significant issues despite achieving success in attractive home markets. For Bloomberg LP, this manifested in over-saturation in the US as well as its dependence on the firm’s data networks. High supplier and buyer power also constituted noteworthy problems. Organisations similar to Bloomberg LP would benefit from a dynamic strategic approach with a focus on risk minimisation and long-term development. The key benefits of such a paradigm are avoiding stagnation and ensuring profitability. That said, strategic decision-making would need to be centred on feasibility and company vulnerabilities to fully benefit from the outlined recommendation. Alifiah, M. (2014) “Prediction of financial distress companies in the trading and services sector in Malaysia using macroeconomic variables”, Procedia-Social and Behavioral Sciences, 129 (1), pp. 90-98. Ang, J. and Fredriksson, P. (2018) “Culture, legal heritage and the regulation of labor”, Journal of Comparative Economics, 46 (2), pp. 616-633. Barfar, A., Padmanabhan, B. and Hevner, A. (2017) “Applying behavioral economics in predictive analytics for B2B churn: Findings from service quality data”, Decision Support Systems, 101 (1), pp. 115-127. Biemans, W. and Griffin, A. (2018) “Innovation practices of B2B manufacturers and service providers: Are they really different?”, Industrial Marketing Management, to be published. Bloomberg (2017) “Global Reach, Local Impact”, [online] Available at: https://annualreport.bloomberg.org/bloomberg-lp/ [Accessed on 23 November 2018]. Bloomberg (2018a) “About Us”, [online] Available at: https://www.bloomberg.com/company [Accessed on 23 November 2018]. Bloomberg (2018b) “Bloomberg Publishes 2017 Annual Report”, [online] Available at: https://www.bloomberg.com/company/announcements/bloomberg-publishes-2017-impact-report/ [Accessed on 23 November 2018]. Chauhan, Y. and Kumar, S. (2018) ‘Do investors value the nonfinancial disclosure in emerging markets?’, Emerging Markets Review, to be published. Chong, I., Ge, H., Li, N. and Proctor, R. (2018) “Influence of privacy priming and security framing on mobile app selection”, Computers & Security, 78 (1), pp. 143-154. Durante, A. and Elsaid, E. (2018) “How to build a better database: When python programming meets Bloomberg's Open API”, Finance Research Letters, 24, pp. 64-72. Jacobs, B., Cordell, D., Chin, J. and Rowe, H. (2017) “Towards phosphorus sustainability in North America: A model for transformational change”, Environmental Science & Policy, 77 (1), pp. 151-159. Johnson, G., Whittington, R. and Scholes, K. (2017) Exploring Strategy: Text and Cases, 11th ed., Harlow: Pearson Education Limited. Karjaluoto, H., Shaikh, A., Saarijärvi, H. and Saraniemi, S. (2018) “How perceived value drives the use of mobile financial services apps”, International Journal of Information Management, to be published. Kumar, A., Pal, R. and Pal, R. (2018) “Usage of formal financial services in India: Demand barriers or supply constraints?”, Economic Modelling, to be published. LaRoche, J. (2014) “The Outgoing Bloomberg CEO Sent A Memo That Made Some Employees Think They Were Getting Ripped Off On Their Bonuses”, [online] Available at: https://www.businessinsider.com/doctoroff-says-2014-revenue-9-billion-2014-9 [Accessed on 23 November 2018]. Lee, H., Choi, H. and Koo, Y. (2018) “Lowering customer’s switching cost using B2B services for telecommunication companies”, Telematics and Informatics, 35 (7), pp. 2054-2066. Lergetporer, P., Schwerdt, G., Werner, K., West, M. and Woessmann, L. (2018) “How information affects support for education spending: Evidence from survey experiments in Germany and the United States”, Journal of Public Economics, 167 (1), pp. 138-157. Madhavaram, S. and Hunt, S. (2017) “Customizing business-to-business (B2B) professional services: The role of intellectual capital and internal social capital”, Journal of Business Research, 74 (1), pp. 38-46. Miller, T., Levy, D. and Swedler, D. (2018) “Lives saved by laws and regulations that resulted from the Bloomberg road safety program”, Accident Analysis & Prevention, 113 (1), pp. 131-136. Nezami, M., Worm, S. and Palmatier, R. (2018) “Disentangling the effect of services on B2B firm value: Trade-offs of sales, profits, and earnings volatility”, International Journal of Research in Marketing, 35 (2), pp. 205-223. Pereira, E., Silva, M., Cunha Lima, I. and Pereira, H. (2018) “Trump’s Effect on stock markets: A multiscale approach”, Physica A: Statistical Mechanics and its Applications, 512 (1), pp. 241-247. Phademrod, B., Crowder, R. and Wills, G. (2018) “Importance-Performance Analysis based SWOT analysis”, International Journal of Information Management, 44 (1), pp. 194-203. Porter, M. (1985) Competitive Advantage, New York: The Free Press. TradingEconomics (2018) “USA GDP”, [online] Available at: https://tradingeconomics.com/united-states/gdp [Accessed on 23 November 2018]. Wagner, A., Zeckhauser, R. and Ziegler, A. (2018) “Company stock price reactions to the 2016 election shock: Trump, taxes, and trade”, Journal of Financial Economics, 130 (2), pp. 428-451. Zalengera, C., Blanchard, R., Eames, P., Juma, A., Chitawo, M. and Gondwe, K. (2014) “Overview of the Malawi energy situation and A PESTLE analysis for sustainable development of renewable energy”, Renewable and Sustainable Energy Reviews, 38 (1), pp. 335-347.